There were no clear winners in any of today’s sections. Tournament newcomer Jerry Bloom tied for first with Liam Kaufman in quad three. Dennis Li and Garrett Browning tied for first in the six player swiss. Each scored 2.5/3. In a remarkable game, Dennis Li took his king on a middlegame excursion across the board into enemy territory. Amazingly it was extremely difficult to find a way to checkmate him and the players eventually had to agree to a draw. 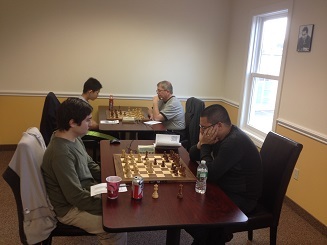 Meanwhile, IM Jay Bonin played in his first weekend quad tournament at the CCFC. After many tough games Bonin finished undefeated but with two draws. FM Leif Pressman shared first place with him. Special mention should be made of Jason Shi whose performance was enough to earn him the rank of master!